When you write about ABBA, it is easy to get lost among incredibly huge numbers and figures. With 360 million sold records, they are second only to Elvis and the Beatles. However, ABBA themselves were never that impressed by numbers, not even if they were connected to Pound or Dollar signs, but when they rejected the famous $1,000,000,000 offer for a reunion tour, many commented, “Turning down a billion? They really must hate each other!” What those critics missed was that ABBA had only just got together for one of their ‘miniature reunions’ and performed a song at a birthday party for their old friend and record company executive, Görel Hanser. There have been a few of those mini reunions over the years, but the big one will never happen unless, as ABBA say, it seems like fun to all four of them. In the 70s, ABBA were often described as the most artificially groomed group ever; their clean-cut image, the good looks and even the love between the two couples were all said to be orchestrated by their charismatic manager and record company owner, Stikkan Anderson. However, in real life, he was initially opposed to the group getting together; he saw Björn and Benny as talented songwriters who had had quite a few hits when writing for other artists and who hopefully would break through internationally one day, but adding their girlfriends and perform the songs themselves? Forget about it! Björn and Benny had been writing songs since the mid 60s when they bumped into each other while touring Sweden with their respective groups, and when they released their first and only album as a duo in 1970, it was only natural that the two very successful singers they were in love with were hired to help with the back-up vocals. The album failed to impress the record buyers, but one single became a big hit, Hej Gamle Man (Hey Old Man), the only song where Agnetha and Frida’s voices were as prominent as the boys’. Nevertheless, they all kept helping each other out when it came to recordings and during the work for a planned second B&B album, the girls joined the boys in the studio, and the song often described as the first real ABBA song was born. They all felt that People Need Love was the best piece they had ever produced and, after some convincing, Stikkan agreed to release the single under the not-so-smooth group name Björn & Benny Agnetha & Anni-Frid. Although they were sure that People Need Love would be a hit, they did not plan to collaborate permanently and did not even bother to have a new picture taken for the sleeve. Instead, they settled for a promotion photo from their 1970 fiasco, and the recordings made after were still intended for Björn and Benny, with the girls credited as back-up singers only. Not until the end of the year, the plans were changed to actually making an album that featured all four of them. By 1973, the group started to get serious and entered the heat for the Eurovision Song Contest with Ring Ring. Agnetha was about to give birth to her and Björn’s daughter just around that date, so they were prepared to perform the song as a trio, but baby Linda was not born until almost two weeks after the contest. The song did not convince the expert jury, but went on to be one of the biggest hits ever in Sweden; at one time it held the top three positions on the sales chart with the English and Swedish singles and the album respectively. It also became a hit in several European countries although it failed to chart in the UK. ABBA, as the press had began to call them, knew that they were on to something, and Stikkan started to make plans as to how to conquer the world. Today, winning the Eurovision Song Contest does not do much for your career and, in all honesty, it did not do that before 1974 either. Somehow ABBA thought that the world was their oyster when Waterloo won the competition, but it became obvious that it was rather the song itself that was a gem when Waterloo broke away outside the world of Eurovision, even reaching an impressive 6th position in the US chart. It is even possible that ABBA would have become big faster in the UK without the ESC mark. Their follow-up singles, Honey Honey and So Long, kept them in the spotlight in Europe and I Do I Do I Do I Do I Do topped the charts in Europe, Australia and South Africa – but it was not until S.O.S was released more than a year after Waterloo that the Brits bothered with ABBA again. Though topping charts around the world, a 6th place in the UK was considered a relative success, and when Mamma Mia finally went to No. 1 in Britain, they were already the most popular group in most of Europe and Australia. From then on, it seemed that ABBA could do nothing wrong as far as the Brits were concerned; every album went to number one, and each single became a hit. In the end, they had no less than nine #1 singles in the UK and another eight that reached the top five. Still, they were not too sure about the UK when they planned their first world tour and decided to play in the not-too-big Royal Albert Hall to avoid playing in front of a half-empty arena. They need not worry though; there were a staggering 3.5 million applications for tickets! Previously, most of the world had only seen ABBA in Lasse Hallström’s iconic videos, or music-clips as they were referred to back then. Still today, no-one can think of ABBA without the classical close-ups of Agnetha and Frida’s mouths, the pairing up in different constellations and the…ehm… choreography. Today, it seems amazing that they usually filmed two videos a day and that the total cost of all would not cover a single budget video for MTV. They decided that Lasse Hallström should also film the tour, footage that was at first intended as a souvenir for those involved, later as a TV documentary, but once they got to Australia it had grown into a full-length feature film in wide screen format. The script was more or less written as they went along, ABBA were not told much about it, and the whole project could easily have turned into a pile of useless film spools, besides the concert shots that is. ABBA The Movie was, to say the least, not popular among the critics, but was one of the biggest commercial successes of 1978. As the years have gone by, it has been re-assessed, and it is sometimes seen as the forerunner to Spinal Tap. Being constantly in the limelight, ABBA’s private life was anything but private; their marriages, births of children and divorces were closely followed by the media. Their private life was also echoed in their songs and when Björn let his and Agnetha’s divorce inspire the lyrics for The Winner Takes It All, he was accused of exploiting it and ‘forcing poor Agnetha’ to sing it. 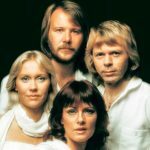 However, the ABBA members have always been insistent that all four always agreed on every song and all the lyrics; if one of them was unhappy, the song was not released. The turmoil in the group’s relations led to speculations that the band would split but shortly after Björn and Agnetha divorced, they performed Chiquitita at the UNICEF Gala which, in the Spanish version, became the biggest hit ever in Latin America. They also released the Voulez-Vous album and went on their ultimate world tour to the US, Europe and Japan. When Benny and Frida announced their divorce at the time of the recordings for The Visitors, it also was incorporated in a song; When All Is Said And Done was recorded just a month after the divorce. Björn later said he was unsure whether it was fair to ask Frida to sing it, but she has since commented that she found strength from singing it. When The Visitors was released in 1981, it was very different from previous ABBA records. The album seemed darker, more mature and not as easily accessible and even though it topped the charts, the singles scored less well in the UK: One Of Us was most successful, reaching third place (although it was number one in the unpublished but oh-so-important Christmas week list), but Head Over Heels only managed to reach a disappointing #25. Although it entered the top five in a few other countries, it was clearly their biggest flop since 1974, and it still remains a mystery why it was chosen as a single; while it was possibly the most traditionally ABBA-sounding track, there were clearly better songs with more hit potential on the album. The plans for the next album changed over the year; at one point, ABBA intended to release a double album, with one LP recorded live at concerts to be performed somewhere in Europe and the other a new studio album. However, the live album idea was soon scrapped, and the work on the studio recordings progressed very slowly. In the end, ABBA decided to release a collection of all their singles, with two new tracks added: The Day Before You Came and Under Attack. The first went into the top five in most of Europe, and the latter was similarly successful in a few countries. The UK, however, was no longer buying ABBA singles, and both singles struggled to get to around No. 30 in the chart. On the other hand, the album scored better and was another number one hit. It was optimistically called The Singles – The First Ten Years, and though she smiled bravely, Agnetha sighed, “Oh no, not another ten years…,” when asked if there would be a part two a decade later. After ABBA, Björn and Benny have written two successful musicals, CHESS (together with Tim Rice) and Kristina Från Duvemåla, which has just been translated into English for a planned Broadway production. Benny has released a few solo albums and keeps topping the sales chart with his band, Benny Andersson’s Orkester, that began as a hobby-horse. Their short summer tour of Sweden sells out each year. Besides, Björn has been writing lyrics for Benny’s new songs, and both have been involved in the work on Mamma Mia!. Frida has released three solo albums after ABBA, the most successful being Something’ s Going On, produced by Phil Collins. Since the release of her latest Swedish language album, Djupa Andetag, in 1996, Frida has only made a handful of recordings, including her opera debut with Filippa Giordano. She is involved in various charities and environmental organizations. After releasing a few albums in the 80s, Agnetha returned to the music scene in 2004 with My Colouring Book, an album with covers of songs from her teens. Agnetha has chosen to live her life outside the spotlight, which has inspired the press to describe her as a recluse although she regularly attends concerts and goes out dancing. All four have expressed that ABBA is an important part of their lives that they look back upon with joy.